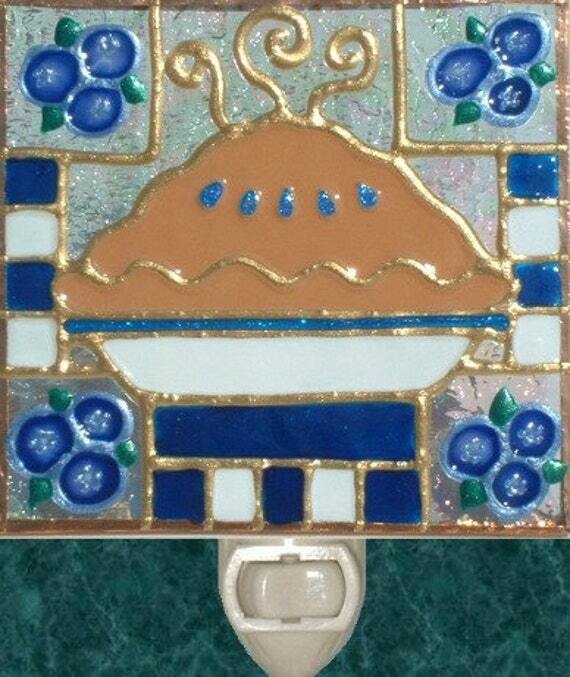 There’s something for every kind of decor with our decorative kitchen stained glass nightlights. Our favorite designs to paint are the roosters and the grapes with their Tuscan flair, although it’s hard to decide with so many options. We have cozy designs like the pumpkin and the apple pie. Bright cheerful fruit and flower decor such as the cherries, sunflowers and watermelon. Then we have the more traditional look such as the apples, pear and ivy. We decorate our glass paintings with cute checker borders, dots or sometimes jewels for a more elegant look. Our stained glass artwork is the perfect housewarming gift and a kitchen must-have especially since we use simple color schemes so they'll go with many wallpapers and themes. Remember, you can always tell us if you want to have a design custom-made to coordinate with a particular motif in your room.